In the midst of university mayhem, many students may find it difficult to de-stress, relax, and take a few minutes for themselves. Finding the time to get outside of the library can be tough when you’re surrounded by endless reading and assessment deadlines, meaning you’re less likely to prioritise taking the time to give your mind a break. But even though there are obvious recommended methods of reducing stress, such as yoga, meditation, bullet journals and general self-care, research has shown that dogs are one of the biggest mood improvers to exist. This research has prompted schemes and initiatives such as “Doggy De-stress” days, or, “The Dog Therapy” event, where dogs are brought directly to campus as a means of helping to relax those who may be having a stressful time at university, or even those who may be missing a pet back home. But given that 82% of students are reported to suffer with stress throughout their university career, many may want to spend more time with these cuddly friends than just a one-off session. Despite this, living in student accommodation can mean that students are relatively limited in terms of looking to own a pet, and therefore access to a dog may not be as easy as you’d think. With an impressive number of over 580 members, the Sussex Dog Walking Society is one of the most popular societies on campus. 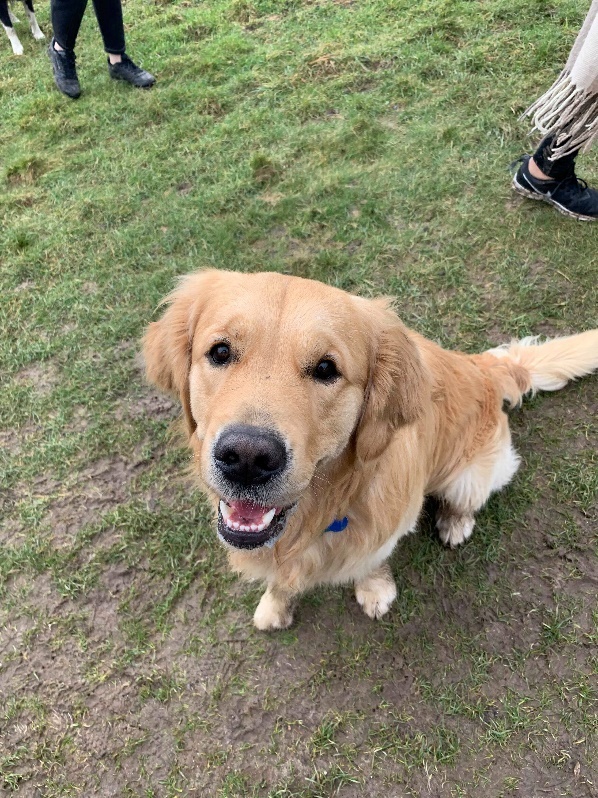 Every week they hold dog walks (Wednesday and Friday from 12:00 – 13.30), and for students whose timetables may interfere with the weekly walks, the society aims to hold events during other days throughout the week. The dogs involved in the society all come from loving owners based in Brighton. Some are from ‘borrowmydoggy’ – a website which allows dog owners to connect with local people who would like to look after their dog, and others come from owners who have contacted the society specifically, asking if their dog can join. There are around fifteen dogs on each walk, however this number can increase to twenty-one, and there is always enough time for cuddles before and after the walks. When did you join the Sussex Dog Walking Society? Do you feel as though being around the dogs has helped you to de-stress? Absolutely! The dogs bring so much happiness to my life, I love getting to know each and every dog and their walker! We go on a walk through Stanmer which is a beautiful nature reserve that everyone at Sussex has on their doorstep. What has been a highlight of being a part of this society? When did you join the Sussex Dog Walking Society? Start of 18/19 academic year. What does the society mean to you? Honestly the society means a lot of different things to me. But I think the biggest thing for me is that it’s a way of connecting with other people. Other than being able to establish a bond with dogs, the society is also a massive link to other people across the university- students and staffs alike. I’ve met so many people within the committee and on our dog walks whom I’m good friends with now, and it has really made an amazing impact in my university journey. Do you feel as though being around the dogs has helped you to destress? Yes, seeing their friendly, happy, sweet dog faces just melt all my anxiety and worries away. I can always return with a smile on my face. Walking with them in the outdoors, fresh air and away from stuffy indoor working space has really improved my mental health. Walking and playing fetch with them is good way to get some exercise too. I joined in October 2019. It was my first term at Sussex. I love the society. I made friends, met lovely dogs and it helped me relax from university stress and stop overthinking. Absolutely! I am looking forward to the walks every week. They motivate me to spend more time outside and help me to relax so much that I became stronger: mentally and physically. I have two highlights. The first one was when we had dogs on campus for a Christmas card sale. I was on my way to an interview – pretty nervous so seeing the dogs and cuddling with them helped me relax so much that I could go into the interview much more relaxed. The second one was meeting two very special dogs (Kali and Maggie). Both with terrible backgrounds, but they show so much love and trust all the lovely new people they meet and have the hugest hearts I know. To see them every week is very encouraging. It gives me hope and a feeling of peacefulness. When did you join the Dog Walking society? The society has become my whole world as I’ve met some amazing people and dogs. I’ve also participated in some great events and have had a good laugh at socials. Do you feel as though being around the dogs has helped you destress? The dogs are now my stress coaches as whenever I’m feeling down I can walk a dog and all my concerns leave me. What has been a highlight of being part of this society? The highlight for me is seeing the smiles on the faces of society members when they see our dogs gathering on the grass by the ACCA. I’m so relived I chose to came to Sussex because otherwise I would never have become part of this incredible group of people and adorable set of dogs! Due to the popularity of the society, committee membership is relatively full. However, new people are welcome to join the Society walks, given that they buy a £5 membership on the student union website to cover all of the dog essentials. For general enquiries contact the Sussex Dog Walking Society Facebook page.